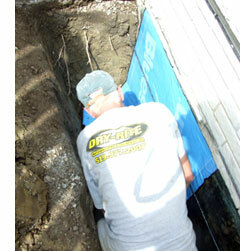 Dry-Rite specializes in repairing wet or leaking basements and crawlspaces. Along with basement waterproofing, we repair foundation cracks and remove dampness, mold and mildew problems from your home. Based in Windsor, Ontario, we service the Essex County Region which includes Tecumseh, LaSalle, Amherstburg, Essex, Leamington, Kingsville, аnd Belle River. If you have a flooded basement or a crawl space with mold, you’ve come to the right place. We are professionals in creating waterproofing systems for all types of structures. Our foundation repair solutions and waterproofing systems are designed for long life and durability to transform your basement and crawl space into dry, usable areas. Our products and installations come with a 10 Year written warranty, for both residential and commercial work. We offer a free, no-obligation basement and crawl space waterproofing estimate that includes an on-site inspection and a written solution that will solve your problem. Serving the communities of Windsor, Tecumseh, Amherstburg, Essex, LaSalle, Kingsville, Leamington, Belle River, Wheatley, and Tilbury.